From “Mammals of Lake Tahoe” by Robert T. Orr, California Academy of Sciences. Shrews are the smallest mammals found in the park, with only the Merriam canyon bat as a possible rival (see page 61). Four of the five species found here are less than half the size of a house mouse, have small feet and are some shade of brown. The exception is the mountain water shrew, which will be dealt with later. All five have sharp, pointed noses and tiny eyes. Again excepting the water shrew, they can be identified as to species only by the expert who has the specimen in hand. They are among the most voracious of animals, requiring approximately the equivalent of their own weight in food each twenty-four hours! To obtain such quantities of insects, carrion and other flesh (they readily attack, kill and eat mice larger than themselves), a great deal of time must be spent in foraging. They are among the most active of mammals. Food seems to be located mainly by sense of smell. In Yosemite, shrews seem to prefer moist situations and tend to keep under cover, such as matted vegetation, logs and rocks. The runs and burrows of other mammals are often used as highways in the relentless search for food. They have been found at all elevations in the park and apparently are active in winter as well as summer. I remember an occasion, at Upper Lyell Base Camp, one September morning when the thin snow on the ground was marked with tiny shrew trails widely ranging throughout the area. The mountain water shrew is about the size of a house mouse; dark, slaty gray in color. It is apparently never found far from water. The narrow, scrub-willow-lined streams of the higher elevations are a favorite haunt. This form is well suited to stream life. The fur does not get soaked in the water, but holds air within its surface, so that when the animal swims under water, a silvery envelope of air bubbles encloses it. The hind toes are fringed with stiff hairs. This fringe assists it in swimming, by serving much like webbing, and enables it to skitter right across the surface, literally walking on the water. It is said that the mountain water shrew can also walk on the bottom of a stream or pool. Mole run. Note cracks in the earth. The Yosemite mole is well suited for life underground The pointed nose, tapered head, short neck, cylindrical body and lack of protruding ears contribute to smooth passage through loose soil or open tunnel. The short, sturdy front legs with spade-like feet, turned sidewise and equipped with strong, thick nails, form a powerful digging apparatus. A mole can dig itself out of sight before your very eyes, seeming to melt into the earth! The fur is short, thick and reversible as to “lay” so it is not rubbed the wrong way whether the animal is traveling forward or backward. The mouth is placed well on the under side, which would tend to keep dirt out when the animal is digging. Moles have eyes, but they are small and not well developed. Two kinds of tunnels are made and used. The low, raised ridges, just barely cracking the surface, are familiar to gardeners and golfers. At certain seasons, usually just after a heavy snow melts in the spring, these are quite common on lawns and the floor of the forest in Yosemite Valley. They may or may not be re-used after construction. The second type of run is a system of subsurface tunnels, perhaps a foot or more in the ground. Construction of the “deep” tunnels requires disposal of soil removed. At intervals a lateral passage is dug to the surface, dirt carried up and pushed out through the hole. 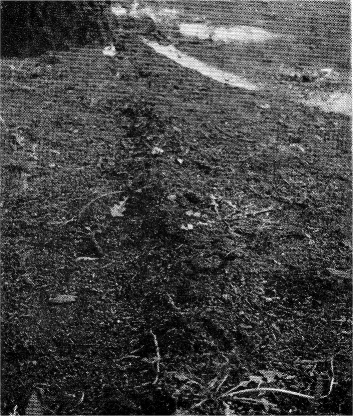 As the action is repeated, earth piles up on the surface of the ground. At no time does the mole expose itself while doing this. Rather than coming out on top, it continues to push the material up from the bottom directly out of the hole. The dirt thus falls uniformly around the outside, with the hole plugged up, so that a mole hill is symmetrical, like a volcanic cone. This is an important difference between a mole hill and a pocket gopher mound (see p. 73). 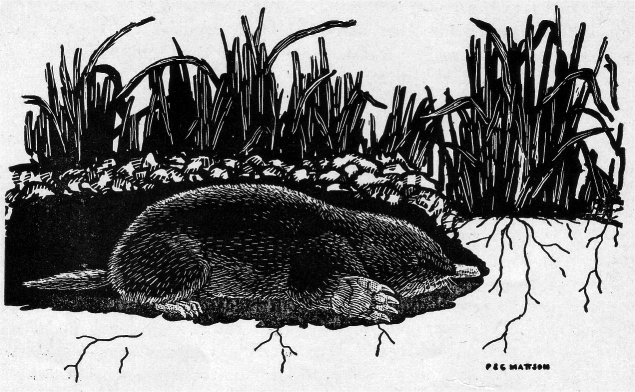 Like that of the gopher, under natural conditions, the work of moles brings about important aeration and reworking of the soil. The chief food is insects, worms and similar animals. Little vegetable matter enters into the diet of the Yosemite mole. It forages widely for enough to eat, mainly in fairly dry meadows, the floor of open forest, or in lawns. In suitable habitats, the Yosemite mole has been found from the lower elevations of the park on the west up to 8600 feet (Tuolumne Meadows). The extremely subterranean life of the Yosemite mole undoubtedly contributes greatly to its safety from attack by other animals. Both moles and shrews possess a slightly unpleasant odor, which may afford considerable protection from predators. However, both are known to be killed by certain hawks, owls, and mammals.